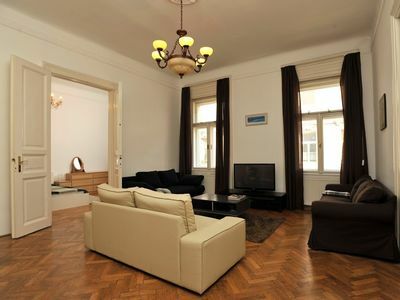 Rent a grand and beautiful apartment in the middle of the city near Astoria, a main square in Budapest, which lies in one of the most vibrant areas of Budapest. There is a high concentration of major tourist attractions within walking distance. THE SPACE This elegant apartment has lots of natural light, furnished with high quality furniture and fixtures and includes all amenities needed for a wonderful stay in our city. This apartment is perfect for relaxing, spending time with family, or working. There are two separate bedrooms. One of them has a queen size double bed, while the other has two single beds side by side, so alternatively they can be combined to a double bed. The large living room has also a sleeper sofa. Up to six people can stay in the apartment with comfort. Aside from the sleeper sofa there are two big comfortable couches in the living room. These may also be used as two extra beds. For your entertainment the living room is also equipped with a tv and a dvd player. 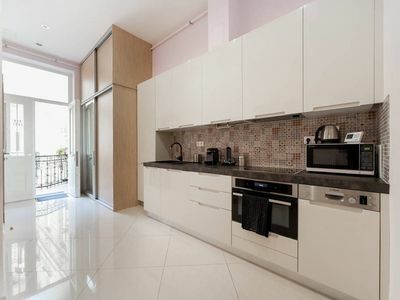 The apartment has a fully equipped American style kitchen with a large dining area next to it. There is Â a large bathroom equipped with a hot tub and even a bidet along with a toilet. High-speed Internet is complimentary with your rental which includes wifi accessible Â throughout the apartment. The building is in a central location, and the apartment is on the third floor (stairs or elevator access) the windows are facing a side street, keeping the street noise to a minimum! In the kitchen there is refrigerator, freezer, microwave, toaster, water heater and of course a stove and an oven. The apartment also has a washing machine, hairdryer and iron. The apartment is in the center of Budapest near Astoria square, which is named after the historical hotel on the square. It's adjacent to the Old Jewish District, which currently the most hip area of Budapest, home to the world famous ruin bars (Szimpla Kert, voted as the second best bar in the world by Lonely Planet is a five minute walk) and trendy bars, cafes, restaurants and clubs. The area is full of life even on weekdays.Â Most tourist destinations are within walking distance, the Grand Synagogue (Europe's largest and the World's second largest) and the National Museum are a 5 minute walk. The Danube River can be reached in a ten minute walk.Â These are but a few examples, you'll find plenty to see, do, and experience without anything more than a good pair of walking shoes! In case you want to explore the city even further you find a stop to Metro line 2 on Astoria which also has stop to several major bus and tram lines.Â Deak Ferenc ter is 10 minute walk and has stops to all three metro lines.Â While Blaha Lujza square is also 10 minute walk which has a stop to tram line 4 and 6 which goes across Budapest and operates 24 hours. We welcome and greet every guest personally, and orient them with directions and sights they should pay attention to based on what they are looking to get out of their visit in my lovely city. We also available throughout their stay 24/7 via mobile phone, email, sms or messaging applications to answer any question or request. 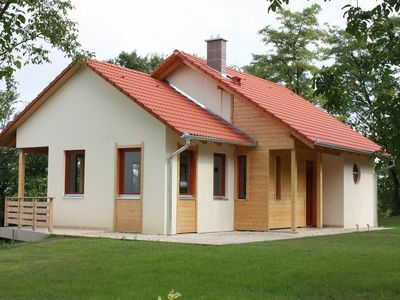 Comfortable modern villa with two bathrooms located on a small park with a view toward Lake Balaton.